Why all the fuss over Sun Spots? Solar Keratosis are also known as Sunspots. These rough scaly lesions on the backs of hands & forearms, face & forehead are very common in Australia! 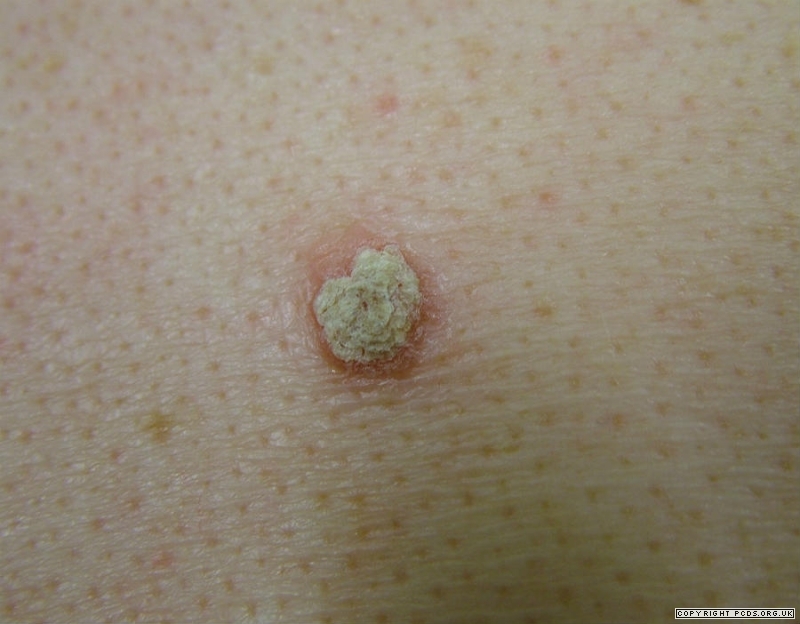 Detecting a solar keratosis is a very common outcome of a routine appointment at a Skin Cancer Clinic appointment. The presence of Solar Keratosis indicates significant exposure to past ultraviolet light radiation and a higher risk of skin cancer in general. Solar Keratosis may develop into an important type of skin cancer: SCC (Squamous Cell Carcinoma). Indeed, Solar Keratosis is an intraepidermal neoplasia and is one end of a continuous spectrum – from Solar keratosis to IEC (Intraepithelial Carcinoma) to SCC. Solar Keratosis may appear similar to skin cancers – particularly IEC. 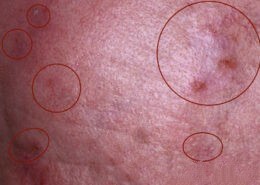 Pigmented Solar Keratosis may appear similar to Melanoma. Because of the risk of transition of Solar Keratosis to Squamous cell carcinoma, areas of solar keratosis are therefore generally treated. The precise risk of a specific untreated Solar Keratosis developing into SCC is not known for certain. One figure from a study suggests that there is a 10% chance that a person with 7 to 8 untreated Solar Keratoses will go onto to develop one SCC within 10 years. 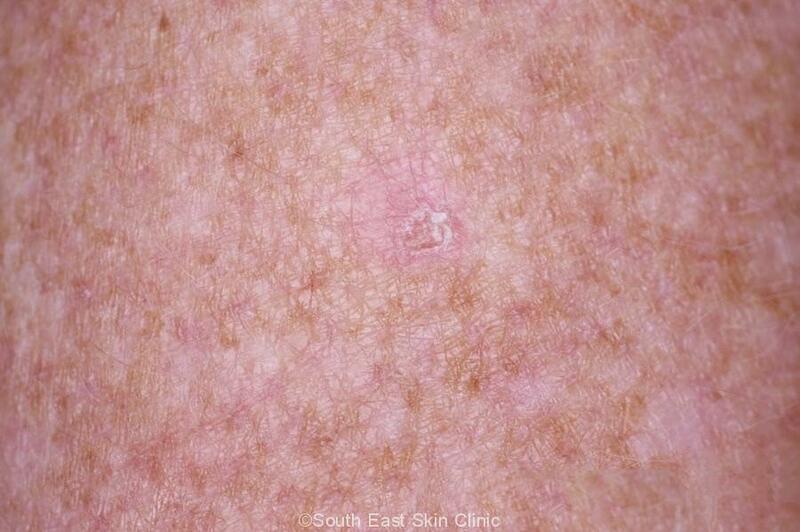 Research suggests that 60 to 80% of SCC arises from solar keratosis. Some Solar Keratoses may go away on their own without any treatment other than good regular sun protection. What does a Solar Keratosis look like? Classic Solar Keratosis (as described above – flat, scaly and red). Need to differentiate from an IEC. Hypertrophic Solar Keratosis – These are raised from the skin (sometimes markedly raised) and covered with a thick scale on a red base. These can look similar to SCC. 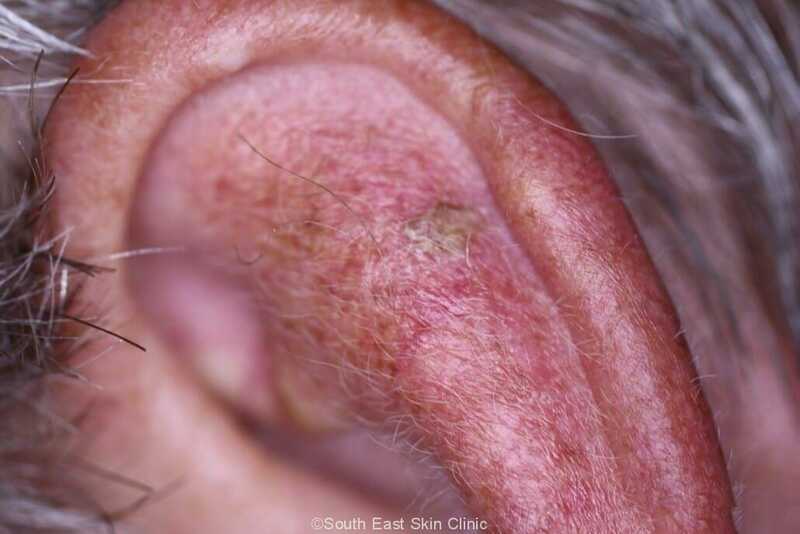 Cutaneous horn – These are thin hard lesions that project up from the skin and are quite firm and often dark. Hence the term “horn” which may also be caused by SCC or a viral wart. See example. Pigmented Solar Keratosis: found most commonly on the face and can look like a melanoma. Actinic Cheilitis: Solar Keratosis on the lips. More common on the lower lips. 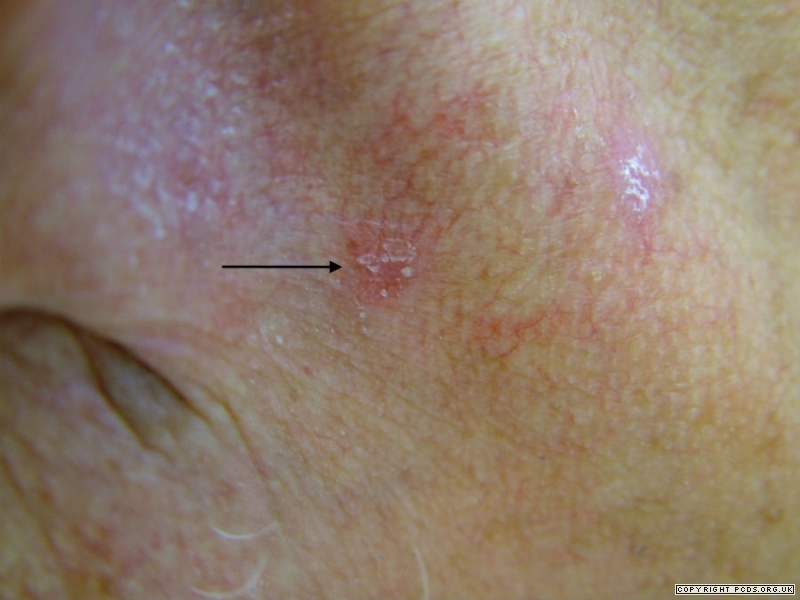 A dermatoscope may be needed to examine the lesion closely to help confirm that the lesion is a Solar Keratosis and not a skin cancer or alternative diagnosis. When there is doubt then a biopsy will be required. What is the treatment for Solar Keratosis? There is usually evidence of of sun damaged skin around a Solar Keratosis – the whole area is called a “field.” The treatments may be targeted to individual Sunspots, or to a whole field. Treatment of a whole field will reduce the risk of solar keratosis appearing in those adjacent areas in the future. When in doubt, it’s generally best to treat a whole field. There are over ten different treatment options available. To cut to the chase, the most widely used treatments are efudix and cryotherapy. 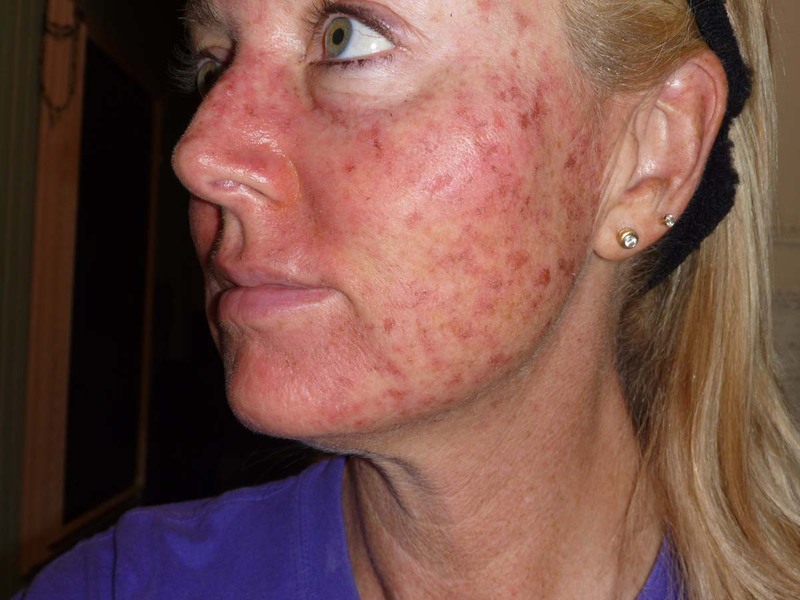 Photodynamic Therapy (PDT): Effective, excellent cosmetic results, generally well tolerated, expensive. Treatment period shorter than with Efudix or Aldara. Salicyclic Acid 5% in sorbolene. Useful for reducing Scale prior to treatment. This may be bought direct from a pharmacy without prescription. Retinoid Creams such as ®Adapalene and Tretinoin, though not approved by The TGA, may be helpful. It’s also a good idea to use regular moisturizer. Cryotherapy: Clearance of around 75%. Freeze time varies from 5 seconds for the thinnest lesions to 20 seconds for longer for thick lesions. Formal Excision: When a biopsy is required to exclude, for example, squamous cell carcinoma. Stitches are required. Curettage: The lesion is scraped off and heals without stitches. Shave Excision: Similar to Curettage and heals without stitches. Many regular attendees of a skin cancer clinic are familiar with Cryotherapy (freezing). The issue with cyotherapy is that it does not treat a whole field. Efudix cream, on the other hand, does treat a field but usually involves several weeks of red and inflamed skin. Aldara and Picato gel are limited by the amount of skin that can be treated at a time. None of these situations are ideal which is the reason why people often choose PDT. However, PDT is still a expensive. There are medicare funding restrictions around Prescribing of Picato® gel & Aldara® – both require “other standard treatments (to be) inappropriate” but patients may opt to have these scripts prescribed privately. 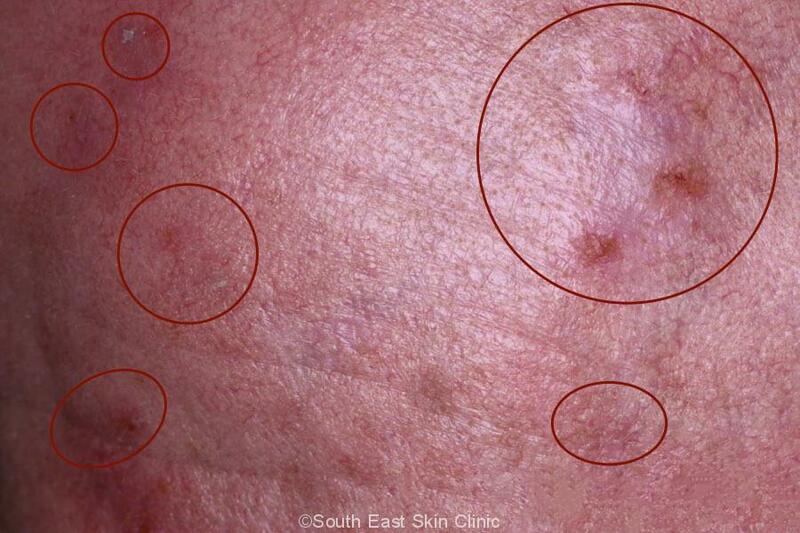 Treatment of a whole field with cream or PDT will reduce the risk of solar keratosis appearing there in the future. Solar Keratosis may be difficult to control in some people. The starting point at home is moisturizer, sun protection and Vitamin B3 500mg twice per day. The Rough Guide to Solar Keratosis Non-Surgical Treatment Options. Remember that many go away with simple daily sun protection! Treatment is usually based on clinical appearance. On occasion, a solar keratosis is surgically removed. These are some of the key terms that may be used in the Solar Keratosis pathology report. The keratinocytes are the cells found in the base of the epidermis. Atypical Keratinocytes look abnormal (the cells are large and pink) because of UV damage. This is why some lesions, left untreated, would have gone on to develop IEC & SCC. The abnormal keratinocytes are the same abnormal keratinocytes found with an IEC – the difference being that the abnormal keratinocytes of an IEC extend throughout the epidermis (“full thickness atypia”). The abnormal keratinocytes of a Solar Keratosis do not extend more than two thirds upwards into the epidermis. In addition, the abnormal keratinocytes do not invade downwards into the dermis (or it’s otherwise an SCC / squamous cell carcinoma). Dysplasia indicates that the cells are abnormal – the cells in question being the Keratinocytes. There is a continuum of dysplasia with mild dysplasia, moderate and severe dysplasia on the one hand and actual skin cancer on the other (IEC or SCC). Keratinocytes produce keratin. Excessive production of keratin leads to a scaly thickened epidermis and this is called abnormal keratinisation. The scale may become thick in which case it will be obvious when you look at the lesion – the scale of a “hypertrophic” solar keratosis can almost be picked off. Very thick lesions are called cutaneous horns and project upwards from the skin as a hard scaly nodule. The keratinocytes normally migrate upwards from the base of the epidermis to the uppermost layer called the stratum corneum – and lose their nuclei in the process. Parakeratosis indicates that the cells have not all lost their nuclei in the uppermost layers of the epidermis. When you look at the evidence, this is simple. Good Quality Sun Protection will considerably reduce the risk of further Sunspots developing, and of course reduce the risk of melanoma and other skin cancers. In terms of Sunspots, The seminal Nambour Study² really should be more widely known. This is an old study simply because it would be unethical to repeat. There were 588 participants in the Nambour study. Each participant lived in & around Maryborough. At the beginning of the study, each participant had between 1 and 30 Sunspots. They were each asked to put on a cream once every morning, with “approximately 1.5 ml to the head and neck and the same amount to each forearm and hand once … and to reapply if necessary during the day.” (Bear in mind that modern sun protection advises 3mls on each of these body areas with very frequent re-application). Half of the participants used sun protection 17 sunscreen, and the other half used a sham-cream. They didn’t know which they were using. And the results? After 7 months, those using the sunscreen had, on average, 0.5 fewer Sunspots whereas those who used the sham-cream had 1 extra Sunspot. The Nambour Study gave great results even with very conservative use of sun screen compared with modern sun protection advice! Sun Spots – The bane of many Queenslanders. 3: Actinic Keratosis, G.Fong, medicine today, november 2016, volume 17, number 11.P.